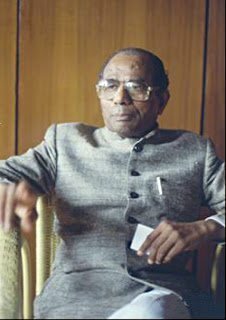 Veerendra Patil, the seventh Chief Minister of Karnataka was in power for two terms. The first term as Chief Minister was between the 29th of May 1968 and the 18th of March 1971. The second term as Chief Minister was between the 30th of November 1989 and the 10th of October 1990. He was succeeded in the Chief Minister’s office by D. Devraj Urs and S. Bangarappa. Chincholi, a small village in Gulbarga district is Veerendra Patil’s home town. Born in 1924, Patil was interested in politics and leading people from a very young age. His foray into politics was through his participation in the local Congress party meetings along with Ramakrishna Hegde. It was their zeal and enthusiasm that got the pair of them recognition in the eyes of former Chief Minister Nijalingappa. Veerendra Patil was elected as a deputy home minister in Nijalingappa’s government. He was elected to represent Chincholi and Gulbarga in the Karnataka Legislative Assembly numerous times. In his first term as Chief Minister, Patil took control over the State administration and he did so with enthusiasm and fervor. The ancient dispute between Tamil Nadu and Karnataka held ground during Patil’s tenure. Tamil Nadu objected to irrigation projects in the Cauvery Basin. The Central Water Commission refused to approve the irrigation projects. Patil, however exercised his power and went ahead with the projects. His action proved fruitful to the farmers whose lands in the southern region of Karnataka benefited from the irrigation projects. It was during his first tenure as Chief Minister that some major changes took place in the State Electricity Board. Karnataka Power Corporation took flight under his patronage. He was also responsible for separating the responsibility of generating power from the other responsibilities of the State Electricity Board. Although his first tenure showed Patil taking power and responsibility, rumors and disputes surrounded all his actions. He was variously accused of being nothing more than a puppet in the hands of Nijalingappa. He was also accused of favoring only members of the Lingayat community over other deserving candidates. It took Veerendra Patil nearly 18 years to erase the allegations levelled against him and his tenure. Post his first term, Veerendra Patil’s party crashed from power in the State Assembly elections of 1972. Patil, however rose to power again after being elected to the post of Chief of the Janata Party (Karnataka Unit). He was unable to keep his post and power. He lost his Rajya Sabha seat to Hegde and subsequently, the party Presidency to H. D. Deve Gowda. He was disillusioned with the Janata party and shifted alliance with the Congress-I party. The State Congress leadership was given to Veerendra Patil as he had a finger on the pulse of people. He was aware of the needs and requirements where Congress-I could step in, he therefore was the natural choice for Karnataka Chief Minister. His win from Bagalkot at the Lok Sabha elections led to his being the Union Labor and Petroleum Minister. His wins and his popularity with the people led to the largest win for Congress to date. Veerendra Patil’s second term came at a difficult economic era. He did not back down from the challenge. His policies on export duty for liquor lead to a boost in the State revenue. Despite not much support and often stiff opposition from his party, Patil took on challenges head-on and saw them through. His honesty and his sincerity towards his job lead to him being a politician who was adored by the masses. He was a power house indeed.